Most fabrics dyed with plant dyes need to be treated with a mordant to produce a light and water-fast colour but woad can be used without a mordant. Traditionally a fermentation vat was used to dye with woad, often started with stale urine but madder roots can also be used to start the vat. The use of both madder and urine are discussed under the Fermentation method, below. The fermentation removes the oxygen from the vat making the woad soluble. Wool or fabric is dipped into the vat, left for a few minutes, and then removed. At first the wool is pale yellow, but with exposure to air, the colour gradually turns to green and then to blue. Repeated dippings create a darker and darker blue. Nowadays, chemicals such as Dithionite (Hydros) are often used to remove the oxygen from the vat. It can be difficult, however, to achieve a dark blue when using a Dithionite vat with silk, as the chemical removes the colour almost as fast as it is deposited. 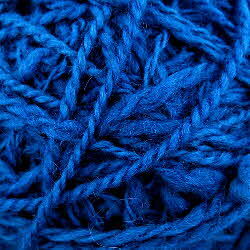 It is, however, easier to get a good colour with wool.